One of the main reasons people should go with a professional landscaping company is the scope of service that an established and reputable firm is able to provide. People do not always realize in advance just how many details will be needed to fulfill their expectations. A truly professional landscaping project will involve design, architectural, and plant material elements. Structures that are created as part of the landscape design will have to be constructed either directly by the professional landscaper or by subcontracted specialists who are held accountable to a landscaping plan. Plants that can grow hardily in Houston will have to be chosen and planted in aesthetically pleasing ways that compliment the home and yard decorum. Many yard service companies are now moving into Houston from other areas of the country seeking work in a stable economy. Many of these companies have little knowledge of Houston climate, indigenous plant life, or service professionals who could provide key elements of landscaping design on a subcontract bases. Inevitably these businesses offer their services at a lower price point than professional landscape companies, and many homeowners feel reassured that the cost savings is sufficient to justify a few compromises in design. However, lasting results are hard to achieve without a sound working knowledge of soil, climate, and plant material. Anyone interested in building entertainment space into their backyard should rely only on a professional landscaping company to create this. There are many forms of outdoor entertainment, and the structures built to support them are determined by the nature of the entertainment itself and the size of the gathering. Matching exterior architecture to an event itself requires an understanding of architecture as well as landscaping. 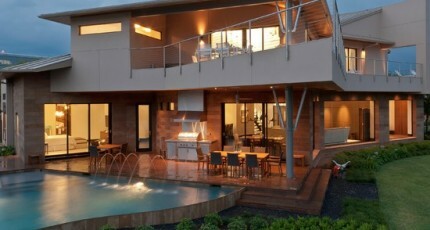 Things such as outdoor rooms for movies, sitting by a fireplace, toasting marshmallows, or hosting a formal function all consist to one degree or the other of extending living space into outdoor space. Yard companies do not understand the nuances of entertainment, nor do they have the construction skills necessary to match architecture to event, form to function. Attempting to save money by hiring a yard service to build outdoor entertainment areas is akin to having a painter build a house. 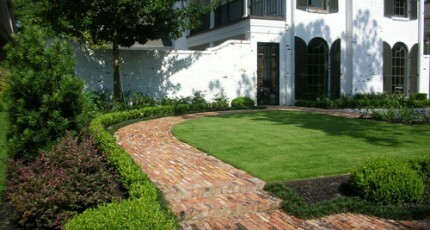 Professional landscapers also understand the importance of creating outdoor areas that are safe and fun for children. In our industry, there is a saying that if you haven’t built something for children, you haven’t built anything at all. In order to effectively design such areas, it is necessary to bring a diversity of design and construction skill sets to the table. Often parents want a special area of the lawn set aside for children to run and play without obstruction. Admittedly, this is something yard service companies can and sometimes do create. However, sports courts and play systems are a totally different matter. Building a basketball, volleyball, or badminton court requires knowledge of the game and an awareness of safety protocols necessary to ensure that play is safe as well as fun. The same principle applies to swimming pool design. A pool has to be more than function. It must be decorative in its own right, and it must compliment the landscape in which it resides. Professional landscape companies offer the advantage of understanding how to integrate a very complex water feature into surrounding greenery and outdoor architecture. Several case studies in our portfolio show in detail how complex this science truly is. There is more to this process than simply subcontracting a pool company and bidding an installation. 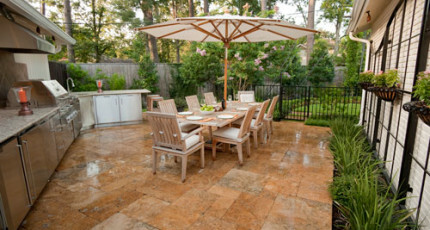 Many times, special materials have to be used for coping and patio surfaces, and often the shape of the pool itself must be custom designed to work with other elements in the landscape. Pool companies seldom consider the impact that these details will have on the surrounding yard. A swimming pool occupies a central position in any landscape into which it is installed. If it does not respect the architecture of the home and compliment surrounding vegetation, outdoor structures, and miscellaneous decorative elements, it will significantly work against every element of the outdoor aesthetic. However, if swimming pool construction or remodeling is managed under the umbrella of a professional landscaping company, then its design and functionality will work harmoniously with all other aspects of exterior design and improvement. Pool companies are but one example of specialty service providers that routinely must be subcontracted in order to comprehensively and aesthetically develop a truly superior landscaping design. Yard companies do not have the infrastructure, experience, or staff to manage such relationships. Their specialty lies in vegetation management, not design, construction, and integration of divergent and complex elements. Many people will attempt to piecemeal a project by having a yard service company manage the yard itself, and then attempt to bring other service companies into the picture on a direct vendor basis. This seldom works, because homeowners do not always speak the lingo, so to speak, of the specialty contractor and may not be able to effectively communicate their expectations. Even in the event that they do, a mason or concrete specialist may not work harmoniously with the pool expert, and what you have at the end of the day is a discombobulated amalgam if great looking elements that do not look so great together. Professional landscaping companies can ensure that none of these negatives pop up by proactively asking the homeowner the right questions to get a clear picture of what look and feel they want out of their landscape, then showing in both design plans and in writing what elements and design are recommended for particular case. Everything is negotiable and clearly up front with an expert leading the client every step of the way toward a clear and expected outcome. Anyone subcontracted on the project will be managed by the landscaping professional, and they will be held strictly accountable to the overall objectives of the project. If all of this sounds too complex and expensive, please think again. 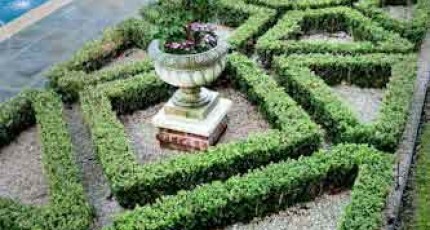 Professional landscapers know how much quality costs, and they know that quality does not always have to involve the most expensive materials or designs. People on a budget can still expect superior results from an established and reputable firm. If the desired outcome is more than they can afford at a particular point in time, then phases of the project can be implemented that are cost effective for the homeowner as steps that lead toward the ultimate outcome later down the line. Again, only a company with advance planning skills, access to a multitude of materials, and the ability to call up the right experts when needed and manage of team of many teams can hope to pull of such a long-term process successfully.